Behzad Yaghmaian recalls the experience of a Sudanese refugee family trying to cross into Europe illegally to seek asylum. 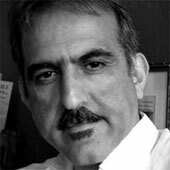 Behzad Yaghmaian recounts the tale of Nur’s journey to Istanbul. Europe alone cannot be asked to single-handedly shoulder the migration/refugee crisis facing the world. The only option for the United States to defeat the Islamic State and end the refugee crisis. The world is on notice: We are facing a looming humanitarian crisis. What is the human cost of militarizing the U.S.-Mexican border?